They come with a ribbon, comb, and poster. They have only been found in Target stores so far, but messages from the company indicate they will be available in other stores as well, but "not Walmart." 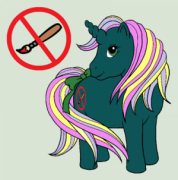 Ponies come with a comb, ribbon, and small poster. The Target SKU number for these ponies is 086-00-2831. Take this number to a Target employee if you're having trouble finding the ponies. Ponies will come with a brush, comb, ribbon, and round sticker. The Target SKU number for these ponies is 086-00-4538. Take this number to a Target employee if you're having trouble finding the ponies. Girls have loved Hasbro's My Little Pony since the 1980s, so to mark the 35th anniversary of the brand, we've recreated the original Pretty Parlor playset in authentic detail! The playset opens to reveal a dressing platform and mirror where you can primp and style your ponies for the big show. It includes an exclusive pony, Peachy, and her friendly cat Twinkles, as well as a basket saddle, 2 hats, brush and bridle. The playset closes up for on the go fun. Relive your childhood, and share the fun with My Little Pony fans of all ages with this timeless toy. Peachy and the Pretty Parlor are now available on Amazon (below). NOW AVAILABLE: Unicorns and Pegasi! Ponies come with a brush, comb, ribbon, and round sticker. The Target SKU number for these ponies is 086-00-2877. Take this number to a Target employee if you're having trouble finding the ponies. Ponies come with a brush, ribbon, and comb. The Target SKU number for these ponies is 086-00-2477 . Take this number to a Target employee if you're having trouble finding the ponies. NOW AVAILABLE: Year 3 Rainbow Ponies! Ponies are presumed to come with a brush, ribbon, and comb. The Target SKU number for these ponies is 086-00-2465. Take this number to a Target employee if you're having trouble finding the ponies. 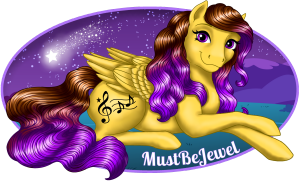 Flutter ponies -- AUGUST 2019! A Lemon Drop with an alternate style Pretty Parlor (and Brandy in a different mold) were also spotted at Toy Fair 2019. Original 6 Ponies: They are currently available at target USA (as we all know). Later this year, USA, Toys R Us and other specialty toy stores should have them as well as Target being restocked. (Walmart currently no but that may change) You should be able to order them online soon through outlets such as Amazon. Supposedly they didn't come to the UK and internationally first because HASBRO UK said that the market is more familiar with the rainbow ponies than the original 6 based on what came out in the 80s so they choose to release the Rainbow ponies first there! Rainbow Ponies - They really are scented!!! Each one is scented a different thing. Some are berries, some vanilla, etc but they are lovely (this was a requested for the market). 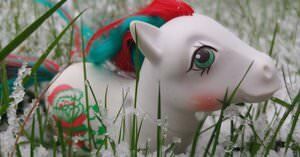 The rainbow ponies should be available in the Fall of 2018 in the USA as well. They are currently sold separately like the collector ponies. The mutli packs are hopefully for Black Friday and other sales. Year 2 Unicorn and Pegasus Ponies - Available later this year in the individual boxes. They are beautiful in person! The glitter symbols are perfect and the hair is so silky. They will also come with original bows and combs. Future - They are currently working on approval for next year's items but I have mentioned that Sea Ponies would be a big deal and she seemed very interested. They get a lot of Big Brother requests so they are listening. Special Ponies - Rumor has it they are working on an SDCC pony (original design) but they might not have it in time for 2018. Stay tuned. 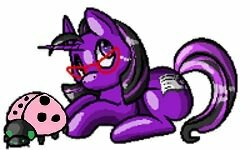 Petitioned Ponies - They have received our mail and are looking into it! They were impressed by how organized the petition were and are currently trying to work with hasbro to make our dreams a reality. (Everything has to be approved by HASBRO). Quality - These ponies are amazing and the team is very dedicated to making the best quality product possible so please support them. They look at all our websites and books that we have created to make the most accurate product possible. They 3D scan and model based off the original ponies. Currently they plan to release 2 lines every year for the next 3 years. Our ponies are in good hands!!! " I just bought 5 of the 6 at my Target today! I used the info MBJ gave, called them and they held them for me. Unfortunately, they didn't have Cotton Candy, but I'm happy that I was able to get what I got! But if anyone does come across an extra Cotton Candy and wants to part with it for cost + shipping, let me know! OK, Butterscotch is packed up and ready to go to her new home tomorrow but Snuzzle is still available At cost + shipping. I would not charge more. So far I ended up with 4 of 6. I was going to get only Minty, but once I saw everyone's Ponies I thought this is a chance to sorta relive the joy of opening new G1s like when I was a teen, so I said "GIMME ALL OF DEM". And my lovely Poopsie found me 4. Oh, and I have an extra Bluebelle if anyone needs her. I just want cost and shipping. And a hug. People have been sending emails to the companies asking for the rainbow set to be brought to other places. New Zealand is getting these now as well. Hi all! Can those of you who bought it describe the posters they come with? Thanks! I have a photo of it on my Instagram! Packaged pictures of the Rainbow ponies have shown up too. But not in stores yet as far as I know. The good news is that the actual Sunlight figure has her proper symbol rather than her cloud looking like a green blob, lol. Guess that one was a prototype. I broke down and bought 1 today. I wasn't going to because I have the first set of re-released original 6 and getting them again seemed redundant but I wanted the poster and couldn't help myself, my store had Snuzzle, Blossom, Cotton Candy and Butterscotch. I left with Butterscotch. If anyone is looking for a particular one I have 2 Targets right by me, I don't mind looking for ya. @Gingerbread I'm still looking for Cotton Candy. If you'll pick one up for me, I can pay cost + shipping. @bluerose9978 I am driving by there this afternoon, I will pop in and see if she's still there. If so I'll grab her! @Ology I will look for Minty too and grab her if she's there. The ponies weren't located with the FIM at my Target. I really had to search around before I found them. They were on an endcap in the toy isles with a bunch of other rereleased 70's-80's toys. There was Strawberry Shortcake dolls, Stretch Armstrong... but they only had one tiny section allotted for the ponies and it wasn't for each pony but just all mixed together. They only had 4 out, so I wonder if they have more and just restock as needed since it's such a limited space? Seems to be a theory that fits with some of the stories I hear with people having a hard time finding them. I want to find them in the wild! I went to Target yesterday and their space was gone! The sticker was still there but a stocker had pushed the SSC dolls over into it. I keep getting the feeling that I will never see them even though they sold out on day 1 here.